The Best Keep Secret Along the Gold Coast of Michigan. "I've been all over the world and these are some of the nicest beaches,"Roberto Villate. Welcome to Muskegon and Pere Marquette Beach. Local kiters and city officials have been working together to establish safe kiteboarding practices for the beach and on the water. 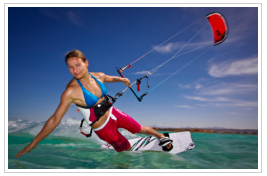 Our goal is to proactively promote kiteboarding safety and prevent hazards or accidents. We believe that this is the best way to ensure that our beach remains open to kiteboarders like you. For the privilege of riding at this beach you must follow the rules listed below. Although these rules apply year round, use extreme caution from June-August during busy "beach days". Please use extra caution when flying your kite on the beach and riding near shore. We ask that you be respectful of this area, other kiters, and all beach goers. If this is your first time to our beach, please seek out any local kiters or instructors BEFORE YOU RIDE if you have any questions or concerns. They will be more than happy to assist you. Have a great session and safe kiting. 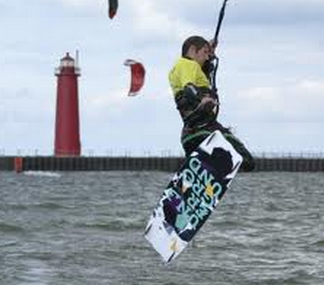 Kiters must give-way and keep a safe distance from all water users. Always give-way to less experienced riders otherwise port should give-way to starboard (right hand forward while riding) for experienced riders. When converging with fellow kiters, upwind kiter must fly high and downwind kiter must fly low. Incoming kiteboarders must give-way to those who are launching. Jumping kiters sacrifice their right of way. Avoid jumping and advanced tricks near the shore or upwind of others in the water. Keep a distance of 200 feet from the designated swimming area marked with buoys and life guard stands. All kiters are expected to have weather knowledge, water safety skills, and know how to self rescue properly. Utilize designated launch/landing area marked by orange cones during "beach days". Gear storage on beach - Keep kite bags, pumps, etc not in use within 50' of Mack Shack and/or sidewalk. Extra boards can be stored by water's edge. Kites must be grounded and properly secured within designated launch/landing area. Lines must be wrapped on grounded kites if not re-launching right away. Do not practice water starts or body dragging in launch/land area. Always utilize assisted launching and landing when other kiters are on the beach. Always make yourself available for helping other kiters with launching and landing. Only experienced kiters should assist with launching/landing other kites. Keep it low and go - Limit flying kite straight up on the beach or at the shore. After launching, get in the water immediately. Maintain 2+ line lengths from beach traffic when flying trainers and when launching/landing kites on the beach. Do not practice jumps, kite-loops, un-hooked, or extended flying while on the beach. No practice flying inflatable and/or full size kites on the beach without an instructor during "beach days". Beginners not able to stay up wind and/or struggling riders must be assisted by an instructor whenever the beach and swimming area is crowded. All kiters must use proper safety leash with quick release at all times. All kiters must have hook knife or equivalent on their person while flying a kite. No walking a kite over the swimming area or beach goers at any time when swim buoys and life guard stands are in place. Kiters who exhibit reckless or hazardous kiting, who do not have the necessary skills for the conditions, or who fail to obey these kiteboarding rules will be reported to the Beach Rangers and may be required to leave the beach. If there are continued incidents your privileges may be permanently revoked. All kiters must help enforce the rules and assist one another to keep the beach safe and protect this riding spot.